Other Common Names: Buckbean, beckbean, march trefoil, marsh clover, water shamrock, bog myrtle, Horblaðka (Icelandic), bukkeblad (Dansih), trébol de agua (Spanish), raate (Finish), trefle des marais (French), Bitterklee (German). 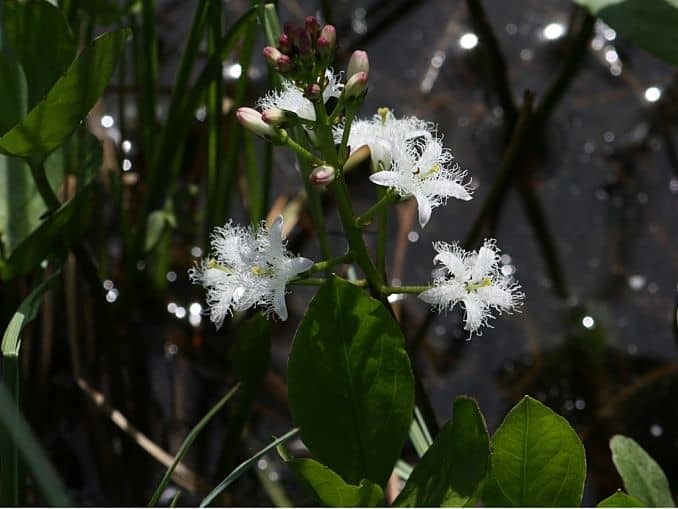 Habitat: Bogbean grows wild in Europe, Asia, and North America. The plant grows in wet habitats and can be found in fens, bogs, along verges of ponds, lakes and slow flowing rivers. 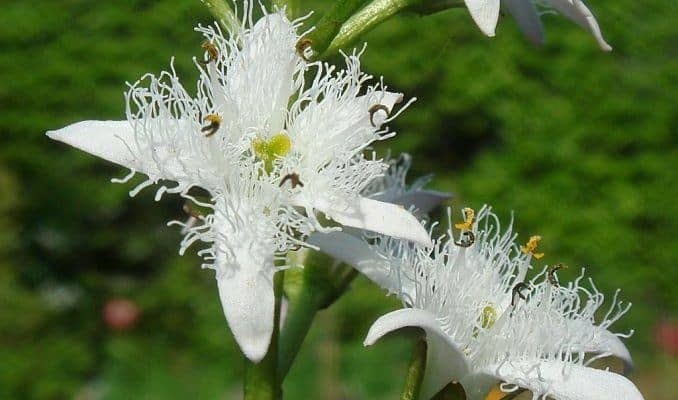 Description: Bogbean belongs to the plant family Menyanthaceae which contains a single species, “Menyanthes trifoliata”. It is a perennial plant that can grow up to 15 to 30 cm in height (above water). The roots are thick, creeping and can both be attached to the ground or free-floating in water. The flower and leaf-bearing stems are erect. The alternate and trifoliate leaves are gathered at the stem’s base. They are coarse and succulent and have a long and thick leaf stems. The flowers are white with a hint of pink and the seeds are round-shaped and break up into two halves. Plant Parts Used: It is the leaves that are used as an herbal medicine. The herb is odorless but has a very bitter taste. The leaves are picked without the leaf stem, preferably when the plant is in bloom and dried at ca. 40 º C or 104 º F.
Bogbean contains the bitter glucosides, menyanthin (found in the leaves) and loganin (found in the roots). It also contains a small amount of volatile oil and the flavonglycosides, hyperoside and rutin. This strongly bitter herb has been utilized for a long time as a folk medicine. An herbal tea made from the leaves has been used traditionally for irregular menstruation, to strengthen appetite, increase the secretion of digestive fluids, indigestion, and enhance nutrient absorption. Bogbean is closely related to yellow gentian (Gentiana lutea) and contains similar bitter glucosides though it is far less bitter than both yellow gentian and centaury (Centaurium erythraea). Like yellow gentian, the bogbean leaves also contain various tannins and flavonoids and should be used with care to avoid irritation of the gastrointestinal tract. 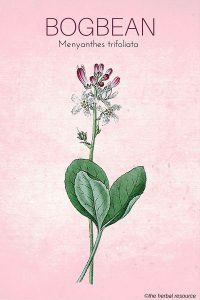 Bogbean is generally used in conjunction with other medicinal herbs. Ailments like dry cough, fever, migraine, gout, arthritis (rheumatoid arthritis), rheumatism, heartburn and muscle weakness associated with chronic fatigue syndrome have also been treated with the herb. It has been used as an external remedy for wounds, for skin rashes, inflammation, itch, eczema and edema. One of the old folk remedies was to use tea made from the leaves, mixed with yarrow (Achillea millefolium) and peppermint (Mentha x Piperita), against the common cold, flu, nausea and stomach flu. When making a tea it has sometimes been recommended to use 1 or 2 grams of the dried herb in a large cup of boiling water, and let it steep for 5 to 10 minutes. The usual dosage is three cups a day. As a liquid extract (1:1 in 25 percent alcohol) 1 to 2 ml can be taken three times daily and as a tincture (1:5 in 45 percent alcohol) 1.3 ml also three times a day. Large doses of bogbean can cause irritation of the digestive tract, cramps, abdominal pain, nausea, vomiting and have a laxative effect. People suffering from diarrhea, dysentery, colitis or ulcers of the digestive system should avoid using the herb. Not many studies have been conducted on the safety and toxic effect of bogbean and until more reliable data on the possible side effects is available the herbs should not be used by children, pregnant or lactating women.